According to my recent survey, many of you are interested in seeing more homemaking tips here on Girls to Grow. I wish I was more adept at homemaking, but since you asked 🙂 I will do my best to share how I try to make our house into a home. 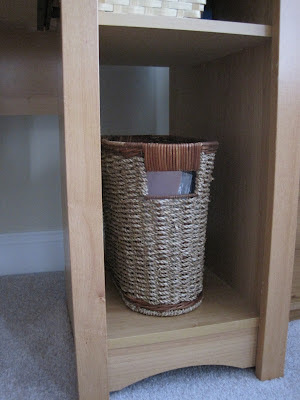 I enjoy finding storage solutions that are pretty and functional. Since our “office” area is part of the open space that includes our living room and kitchen, it became the perfect place for a few of those items. Our computer desk has no drawers, so I’ve had to find other ways to hide paperwork. This magazine holder keeps file folders, notebooks, and extra printer paper handy. I slide it into an open shelf at the side of the desk. This box sits on the floor by our desk and holds files for current year taxes, insurance information, etc. Both of these were purchased inexpensively at stores like Ross and T.J. Maxx. They are just small touches, but I like them so much better in the office area than typical filing or storage containers. 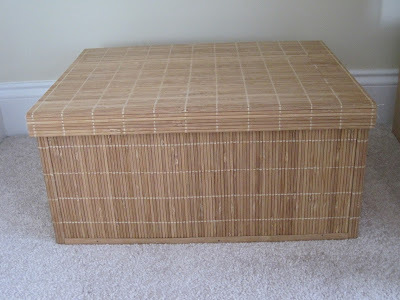 Do you have storage in your home that’s both practical and pretty? Those are great touches! 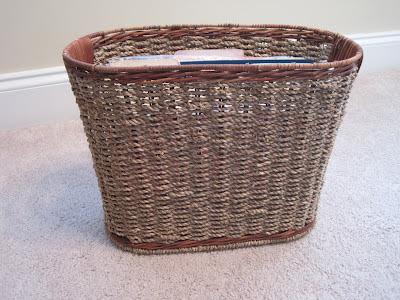 🙂 I like baskets, too, and am always excited to find the perfect one for a particular need. I have to be careful, though. My boys end up making them total catch alls, lol! I have some stacking boxes that are working at the moment – but I'm planning a trip to IKEA in the near future for some storage items! Those are beautiful! I never seem to be able to find pretty things like that at an affordable price. I tend to use plastic storage boxes and try to hide them out of sight.